The Newcomer Award is a newcomer in itself. Introduced in this year to not only recognise those who are new to the industry, but to instil enthusiasm and develop skill and knowledge in those who show a willingness to accept new challenges. In Meg Stanley and Jarom Rhind, the panel has chosen two outstanding candidates. Meg works for Victorian trainer Kathryn Durden and was nominated by co-trainer Craig Durden, who describes her as “punctual, honest, diligent and enthusiastic”. A handy rider when she arrived in the job, Meg has since learned a whole new set of skills. “Meg was a very capable rider when she came to us, and has now learned to ride fast work, school horses over jumps and educate young horses in the barriers,” Craig said. “I have not been in the industry that long and to be nominated is awesome, let alone be a finalist. I’m honoured,” said Meg. 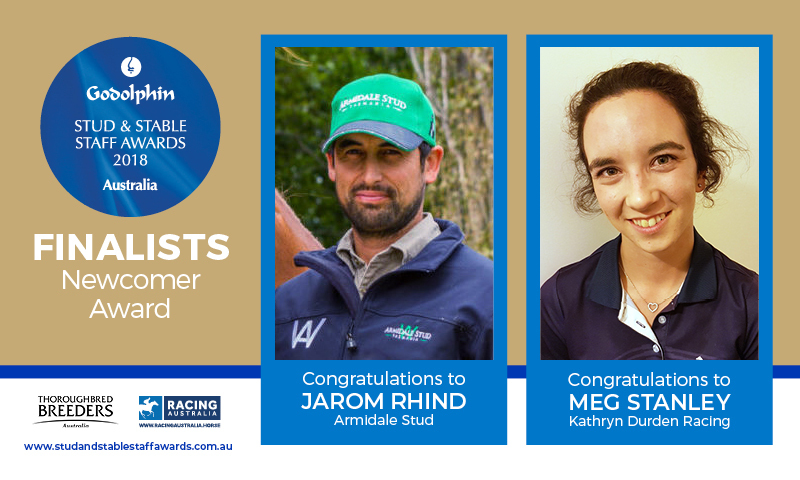 Jarom Rhind has also progressed rapidly since joining the team at Armidale Stud in Tasmania. “We feel really blessed to have Jarom as a member of our team,” said his nominator, Robin Whishaw. “The awards are something I can’t believe, it is fantastic to be a part of it,” said Jarom.